It seems that nearly all credit and debit cards have moved away from the standard magnetic stripe to chips. In fact, many in the industry claim that the magnetic stripe is dead. It’s time to move on to the next big thing. Most likely, you yourself currently hold a card that has a chip. But, what does the chip in credit cards do, anyway? How do they work? That’s what we’re here to discuss, as well as a look into the future of credit cards. What Does the Chip in Credit Cards Do? That little metal chip that hangs out on the edge of your debit or credit card is what’s known as a radio frequency identification card, or RFID. In credit/debit cards specifically, they are called EMV chips. EMV stands for Europay, Mastercard, and Visa. These are the companies who develop and monitor this system, as they are the worldwide standard. While this is pretty new to credit cards, the technology has been around for quite some time. We’ve seen them on government-issued ID cards like active duty military identification cards, access cards, and more. RFID chips are able to store up to 2 kilobytes of data that are unique to the particular person or product they’re associated with. They basically serve the same exact purpose as a bar code or mag stripe. However, they work much more efficiently. The technology behind these chips is pretty simple but offers a lot of benefits. These chips are made up of a small metal CPU devices that contain a single, tiny antenna. These antennas can be picked up by RFID readers around it. Some require physical access, while others can be picked up as long as it’s in close proximity. EMV and other RFID chips work without a battery, drawing power from the devices that are scanning it. They are comparable to tags– they display and offer the information necessary for a decision to be made. Once scanned, the EMV gives off a unique, one-time encrypted code which is picked up and decoded by the POS it’s being read by. The payment system is then able to find your account information from that code and authorize the transaction. You may be asked to enter your pin, you go through the steps, and then you’re on your way! What’s the Benefit of EMV Chips? You may be wondering why it is that we’re moving away from these magstripe systems worldwide. What are the benefits of using EMV chips? The biggest reason has to do with security. 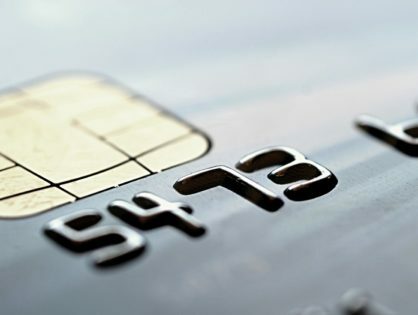 Back in 2013, EMV chips started making headlines after Target had fallen victim to a large-scale scam where nearly 40 million accounts were compromised due to malware accessing information via magnetic stripes. See, magnetic stripes work great, however, they are un-secure and virtually wide open for attackers to access. They store all of your account information on them which can easily be intercepted by a skilled hacker. Magstripes are also easy to duplicate, meaning your account information can easily be compromised if your card is lost or stolen. EMV chips, on the other hand, completely encrypt your information and provide single-use codes that are only good for the particular transaction that populates it. So, even if your transaction is intercepted via malware by a hacker, the information they find will be virtually useless to them. While America has been ahead in a multitude of technological advancements, until recently, we were practically the only country left that was still using the magstripe system. That’s right, while the world had moved on to a safer and more effective method of processing transactions, we were still slugging along with our 1960s technology. Integrating this RDIF system has allowed for international purchases to become a breeze. This was another huge reason for the push to standardize EMV in America. Is This the Answer to All Card Fraud? While EMV does a number of things to prevent fraudulent activity on your credit card, it does not ultimately solve all the issues. There are still several ways that your account information can be compromised. This is mainly from online purchases. For now, you still must enter all of your billing info in order to buy a product or service online. There’s no chip readers in our phones and computers just yet. This means that you are susceptible to fraud if online POS systems are compromised by hackers. You can also be fooled by entering your card information on a fraudulent site. You can also still be in some trouble if your card is stolen. While it’s incredibly difficult to duplicate or extract information from the chip, most all cards still have a magstripe on them. That’s due to the transition period we are in, as not all POS systems are capable of reading chips just yet. In many cases, it’s still up to the business to help prevent credit card fraud. Not all banks are required to issue new cards with chips, and some are choosing not to. Not all retailers currently hold chip card readers and are relying on magstripes for the transaction. Until these two major problems are solved, our chip cards will still have magstripes, and our information may still be at risk. However, the risk has been significantly decreased and is continuing to keep people’s accounts safe. So what does the chip in credit cards do? Provide security, convenience, and peace of mind. For the business owner, accepting chip cards on face-to-face transactions offers a significant advantage! This is because chip card technology shields the business owner from any losses on transactions due to fraudulent card transactions. If your business accepts chip cards, the bank takes the loss, not your business. This is certainly the way of the future, and won’t be going anywhere anytime soon. Are you a business owner looking for more information about chip readers for your busniess? There is no better time than today, and if you mention this article, we will offer you a chip card reader at no cost. Call Wholesale Payment Partners at 844-872-SAVE to inquire about chip cards and our wholesale processing pricing plans. Check out this awesome article on deciding whether or not you need this.